You may blink when you glimpse the from the gravel service road: a pale slab floating like a rogue iceberg on a stark chunk of rock about 16 kilometres off the northeast coast of Newfoundland. Open the inn’s massive red-knobbed front doors and the interior—and the welcome to come-from-aways—is ridiculously warm. There’s a riot of colours on nubby textiles, a pot-bellied stove, weathered wooden furniture. The lobby smells of wood fire, clean hung laundry, home. I’m handed a hefty bronze room-key fob, cast from a caribou vertebra found on the property. This is not your typical luxury hotel. 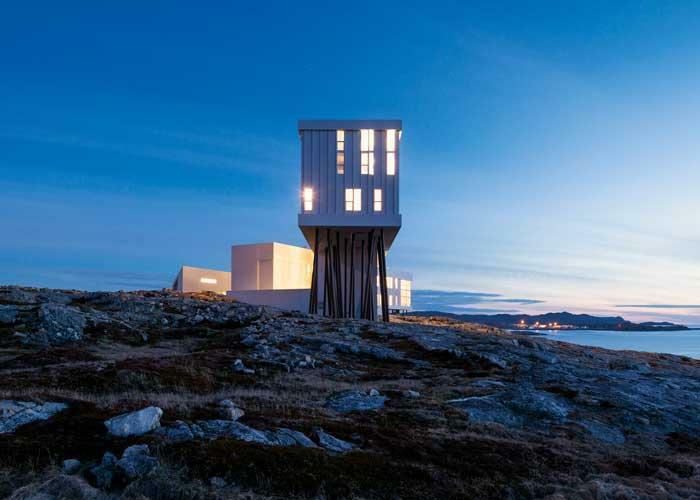 You may blink when you glimpse the Fogo Island Inn from the gravel service road: a pale slab floating like a rogue iceberg on a stark chunk of rock about 16 kilometres off the northeast coast of Newfoundland. Open the inn’s massive red-knobbed front doors and the interior—and the welcome to come-from-aways—is ridiculously warm. There’s a riot of colours on nubby textiles, a pot-bellied stove, weathered wooden furniture. The lobby smells of wood fire, clean hung laundry, home. I’m handed a hefty bronze room-key fob, cast from a caribou vertebra found on the property. This is not your typical luxury hotel. The place is so remote it’s on the cover of the book Remote Places to Stay. 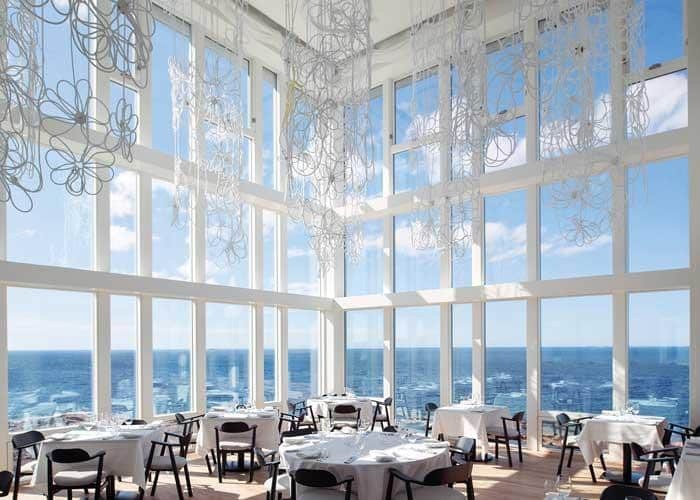 But obscure it’s not: since opening in 2013, the inn has won global awards and been the subject of an excellent documentary, Strange and Familiar, about its radical architecture. 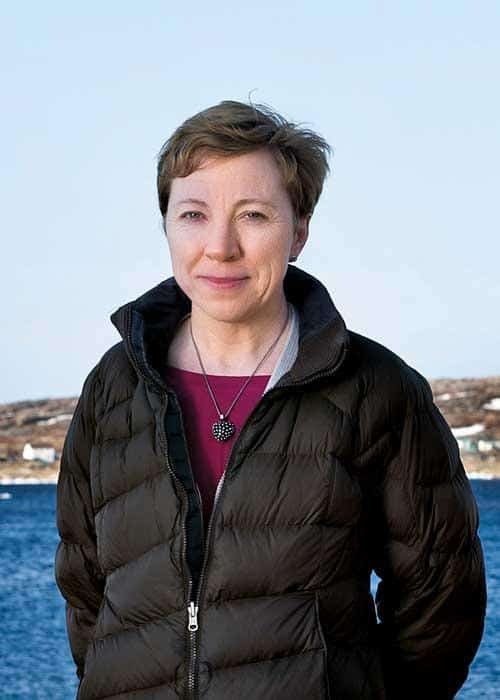 It could only have been created by native Fogo Island daughter Zita Cobb, a business veteran with much more than commerce on her mind these days. The spinoff jobs and economic activity are substantial. 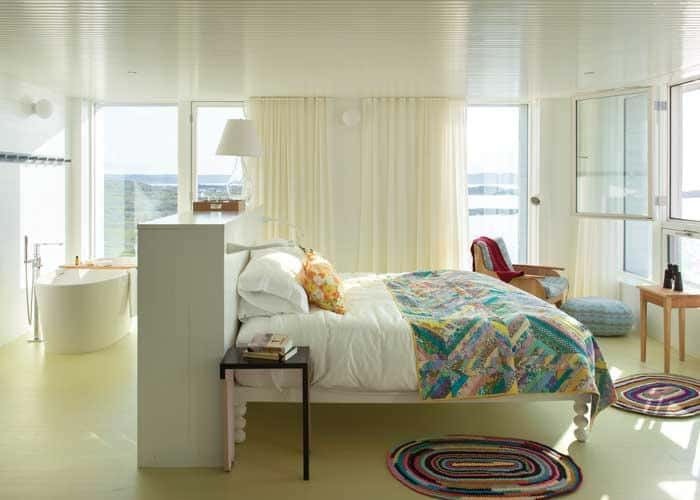 Almost everything in the guest rooms (except the Starck for Duravit heated toilets, presumably) was made on Fogo Island: custom wallpaper, rocking chairs, quilts (signed in stitch by their makers; Rita Penton crafted mine). These items, now made and sold in vintage buildings restored by the foundation, are so popular that fans order them worldwide (Gwyneth Paltrow’s raves didn’t hurt). There are no TVs in the rooms, but Atlantic “television,” endlessly coursing outside your seaside window, is mesmerizing. Now he’s a believer who proudly shows me Fogo’s sights, from its six communities of painted-wood houses to 18th-century French cannons to the local wireless station (now a museum) that got the Titanic’s distress signal. Foley points out the trailhead for Brimstone, a rock formation that juts out like a sphinx. I see the handful of arch-modern studios (including that radical white wedge you’ve seen in the Apple ads) that host writers and artists from around the world. Courtesy of Fogo Island InnWe say “hey” to Patrick, proprietor of a popular “shed”—an ultra-local pub, with a cottage-like interior covered in maritime memorabilia, band and hockey paraphernalia, and Irish flags. I wonder aloud if tourists ever stop by this local clubhouse: “Everyone’s welcome,” Patrick declares. Room and board are included in a stay at the inn (with the exception of liquor, but the Nova Scotia Benjamin Bridge Nova 7 rosé is totally worth the $16 a glass). Tipping-fatigued travellers will be pleased that that’s included, too: all staff share in a tip pool created by 15 per cent of the profits. Each meal is special—from the early-morning basket of coffee and pastry left outside your door to thick breakfast pancakes with island crowberry jam, oceanside cookouts at lunch and extraordinary dinners. Courtesy of Fogo Island InnOne night I order a theatrical pre-dinner cocktail, its heavy crystal tumbler smoked by a wisp of burning birch bark before rosemary-muddled bourbon is added. My starter is crispy breaded cod tongues on braised fennel and celery that looks like delicate sea flora, a poached duck egg flooding the plate like a tidal pool. It tastes as remarkable as it appears. The meal looks like something you’d get at Noma in Copenhagen and feels like the start of a unique Newfoundland Nordic cuisine. Sometimes tourism ends up destroying what it’s meant to celebrate, when too many people rush to enjoy unique experiences that quickly become common and commercial. The inn feels just-right-sized, bringing new life to this remote speck of rock in the Atlantic, but not enough to change it from the fishing community it has been for more than 250 years. If this is what social enterprise looks like, book me for a repeat visit. Want to Go to Fogo? Nobody said getting there would be easy. From YVR, count on an approximately 19-hour travel day—or stay overnight in Montreal, Ottawa, Toronto or Halifax to break up the trip. You can set your own small private plane down on Fogo’s airstrip, charter a helicopter or simply have the hotel send a car to ferry you across from Gander. Coordinate flight-arrival times at YQX, the closest airport, with the charming ferry that leaves from Farewell, Newfoundland (just over an hour’s drive from Gander). It’s a 45- to 75-minute sail to Fogo, depending on the route. If you have layover time in Gander, the eastern Newfoundland outpost has a proud aviation history that’s worth exploring. The North Atlantic Aviation Museum has a DeHavilland Tiger Moth and other vintage aircraft, plus tales of the town’s strategic role in the Second World War and, more recently, in housing stranded passengers on 9/11. 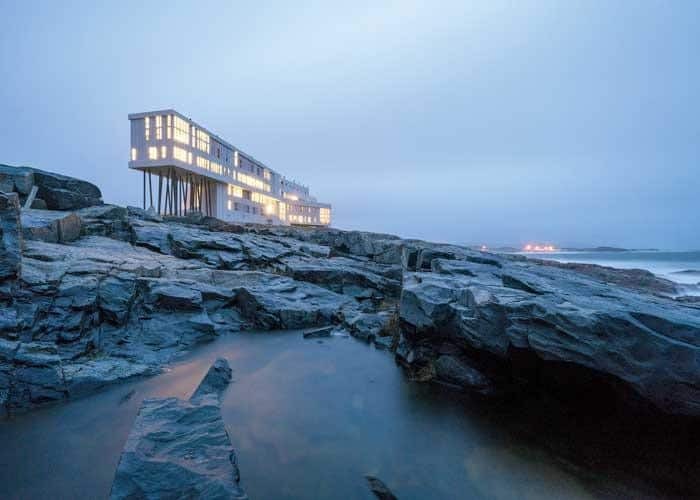 Through May 2018, Fogo Island Inn double-occupancy rooms with full board (excluding alcohol) start at $1,675 a night, including a half-day orientation tour of the island.